Stainless has a sleek, smooth surface that stands up to hard use and resists bacterial growth. The best thing about stainless steel is that if you take good care of it, it will last almost forever and look great the whole time. Fingerprints, smudges, and a dull look can make your stainless look old and well used. Using traditional kitchen cleaners might be able to remove some of the dirt and grim, but the shine just never comes back. In this guide I will share smart tips and good advice on how to clean stainless steel appliances, including your refrigerator, stove, sink and faucet, microwave and countertop. I’ve also included cleaners that are safe to use on your stainless steel cookware. What is the best stainless steel cleaner? We’ve picked and reviewed some of the best stainless steel cleaners on the market to help you keep your kitchen looking fantastic. If you’re new to stainless or unsure of what cleaner to purchase, a safe choice is Therapy stainless steel cleaner. This cleaner makes cleaning and polishing simple by offering a solution that both cleans and polishes. So there is no need to clean with one product and polish with another which not only requires more elbow grease, but takes valuable time. Unless you like getting up close and personal with your appliances, it’s not required for routine cleaning with this product. Therapy Premium stainless cleaner is a “wipe and go” ecofriendly product that is ideal for general cleaning for most home kitchens. There is a very light clean smell to it and best applied on dry surfaces. I think this is partly due to a type of oil within the solution itself that adds protection and the polished look. Could you use this on other metals? Sure. Should you? Probably not because it’s designed specifically for cleaning stainless steel. What it won’t do? Take off rust that has settled in. For that you will need a rust remover that is safe for stainless steel that contains an abrasive or solvent in the mix. How Do You Clean Stainless Steel Appliances? Establish A Regular Cleaning Routine! It’s a lot easier and more effective to keep your stainless steel clean on a regular basis than to have to perform heavy cleaning infrequently. The best way to clean stainless steel is to provide gentle, regular, consistent cleaning. Using the right kind of cleaning implements is of the utmost importance in keeping stainless sparkling clean. Frequent cleaning with a sponge or soft cloth should be adequate. Microfiber is an especially good choice. 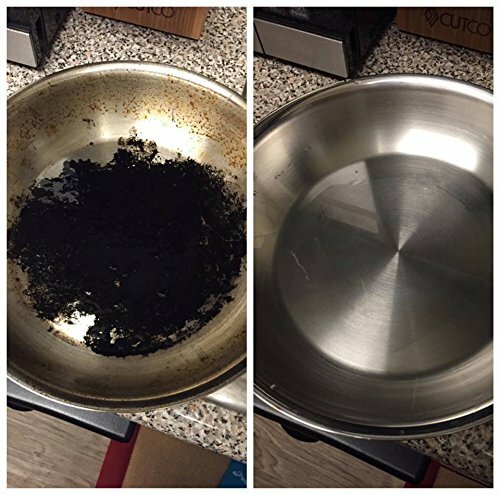 It’s important to note that if you’re cleaning stainless steel cookware, not all cleaners are safe for this application. You should consider something like Bar Keepers Friend that is marked safe for those surfaces. See our full Bar Keepers Friend review for uses and ingredients. Wipe your stainless steel appliances and surfaces down every day with a soft cloth or sponge and plain, warm water to start. Add a mild cleaner such as dish soap as needed. Be sure to rinse off any cleaners with clean water and dry your appliances and surfaces with a soft cloth, or microfiber, to prevent water spotting. Some cleaners require a dry surface to do the cleaning, so I recommend that you do the heavy lifting with soap and water, let it dry and then go over it with your stainless cleaner. 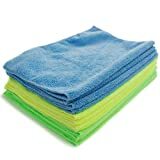 If you’re using a microfiber cloth to clean your kitchen, at some point it will get dirty enough that you’ll notice diminishing returns for your cleaning efforts. You can clean your microfiber cloth by tossing it in with a regular load of wash.
Just make sure it doesn’t have anything out of the ordinary on it that could damage your clothing such as bleach or heavy grease. Avoid streaks by making certain to wipe your appliances down in the direction of the "grain". Look carefully at the metal and you will notice faint lines. This is the grain. Wipe with the grain, rather than across it for a better shine. Consistent cleaning is very important with stainless. Harsh chemicals and vigorous cleaning are not necessary because stainless' smooth surface deflects stains and germs. Just use mild products and use them frequently and consistently. One of the biggest hazards is mixing cleaning chemicals. Don't mix and match your cleaning products as you might set up a chemical reaction that could damage the surface of your appliances or cause personal injury such as deadly gases being formed. When you take good care of your stainless steel appliance, you may be surprised to find that cleaning becomes easier with the passage of time. This is because stainless develops a patina as it ages. This helps it to show fingerprints and smudges less. High quality stainless is equipped with a protective film that helps it prevent rust. If this film is damaged by harsh chemicals, metallic scrubbing pads or wire brushes, rust can set in. If you must scour an especially tough spot (e.g. burned on food) use a plastic scouring pad carefully. Never use a steel or copper pad to scrub as this will scratch the surface. Likewise, lengthy exposure to hard water can damage this protective coating and the metal underneath. Stainless steel is rust resistant, but it is not rust-proof. It can take a lot of hard use, but if you abuse it you set it up for the development of rust spots. Always use gentle cleaning methods and products for best results. What is the Bar Keepers Friend? It comes in a variety of forms including liquids and powders. It’s used for cleaning all sorts of food related items including cleaning stainless steel pans, pots, and sinks. In this review we’re specifically looking at Bar Keepers Friend uses on stainless steel. What is in Bar Keepers Friend? What we know is that it does not contain chlorine bleach, it's made in the USA, and not tested on animals. The cloth that comes with this package is quite durable and doesn’t tear easily. So if you prefer to use a microfiber cloth, you can use the included one for cleaning dishes. We definitely recommend checking it out if you have some serious stains that need to be removed. Bar Keepers Friend has a very good reputation for tackling dirt and grime all the while leaving things sparkling clean. Does stainless steel rust? Unfortunately rust can creep up and spread quickly, leaving an area on your stainless looking damaged with reddish-copper mess. If left too long, the metal will become thin, frail, and wither away. No matter how much you use other cleaning products on it, they won’t be able to tackle the underlying problem and keep you cleaning the same stubborn spot over and over. Don’t worry too much because there is hope for these types of situations! ElminateRust offers a stainless steel rust remover and cleaning kit. While it requires a bit more work on your part, it will allow you to remove those nasty rust stains and bring back a shine. The product comes with Innoshine B570 & B580, a rust remover and conditioner. To remove rust you simply apply some of the remover on the rusted area, give it time, and then come back to scrub gently or wipe it off. You then make a solution of the conditioner and water to clean the area and help prevent future corrosion. Give it a good wipe with a clean cloth and you’re done. One of the best benefits of these products is that you can use them on your stainless cookware, knives and other kitchen tools. I recommend giving them a good rinse afterwards despite them being 100% organic. Before going all in, it’s probably best to test a small spot to see how your rusty steel reacts. While it should be fine for all stainless, a small test is one our recommendations before doing any cleaning or repairs at home. While there are many great rust removers on the market, this is a great little package that contains everything you need to take care of your rust when it arrives. On the opposite end of the spectrum, if you want something that is extremely quick to use consider disposable wipes or towels. These are often in an airtight container already prepared with solution so that you can wipe your appliances, get the shine, and toss in the garbage. Weiman is a brand leader for “Good Housekeeping” and their stainless wipes are no exception. These wipes can clean and polish stainless steel all around your kitchen from countertops to refrigerators. However, they aren’t designed for cookware because of the protective film that is left behind. This also leads to an important point of personal sanitation. If you aren’t wearing gloves when using these wipes, you definitely will want to wash your hands thoroughly afterwards. When it comes to wipes, the Weiman stainless wipes would be our top pick to go to. The cost per wipe is relatively inexpensive if you’re causally using them each week, they’re simple to use and they work. If you hate the idea of adding chemicals around your kitchen, consider these towels. The only cleaning solution that you need is water. Yep, water that’s it! The towels are created from Nanolon® fibers which take care of removing grime, grease, and streaking. 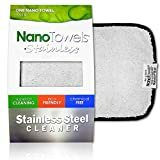 Nano Towels will get dirty and require cleaning. Putting them in a bowl of water with dish soap and then swirling them around will help remove most of the dirt and grime. You may need to do it several times and replace the water until it becomes clear. If you toss them in the laundry, don’t use fabric softener as it might ruin the texture of the towels. These would work well for cleaning your sink and faucet, but with the buildup of dirt in the fibers it could lead to some scratching on appliances if you aren’t careful. Are they a good buy? 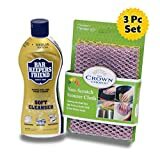 Since you’re able to reuse the Nano Towels over and over, the price seems completely fair even if you have to replace them once a year. Have you ever noticed how clean your kitchen can look when the sink is sparkling? Instead of using a general cleaning product, you might try using a cleaner specifically made for sinks. The reason we chose to include Hope’s Sink Cleaner is that it’s easy to use and does everything easily. You don’t have to work with multiple products to clean and shine. It also creates a film on the metal which helps protect it from stains and water scale from lime. Not only that, but it helps making cleaning easier the next time. That is if you haven’t neglected it too long. Hope’s cleaner works on a variety of surfaces for those who have multiple types of sinks in their home. This product is an all-in-one cleaner, but for some surfaces you will need to apply a protective polish afterwards. I recommended that you add extra protection, especially in the sink where a lot of banging from dishes will occur. 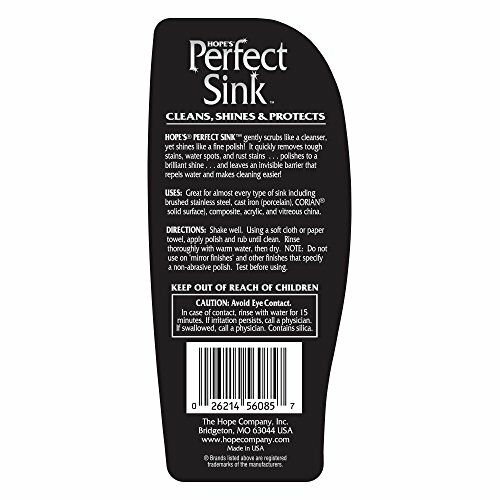 The back of the bottle says that this product is not designed for mirror finishes or ones that require a non-abrasive polish. Hope’s is a mild abrasive polish. Our best pick for stainless sinks is Hope’s Cleaner because it does the job for the appropriate sinks. For those with sinks made from other materials, such as black granite composite, tread with a bit of caution and understand what types of cleaners work best with those materials before using this one. Aluminum is a delicate metal that is easily damaged by abrasives and harsh chemicals. Most of us have multiple types of metal in our kitchens so it’s important to take notice and use the appropriate cleaner. The Cameo cleaner is one of few products that targets both of these metals for household use. In fact, it’s also safe to use with cookware including pots, pans and cutlery. Many users compare this product to Bar Keeper’s friend and report that it is in some cases better when it comes to the final polish. Should you buy it? I think the Cameo Cleaner is an excellent choice for cookware and those with aluminum surfaces in the kitchen. However, if you are just looking for a general stainless cleaner and polish, some of the aerosols and sprays below might be a more convenient choice. If you can’t be bothered to mess with powders, liquids or creams then a spray might be the best option for you. 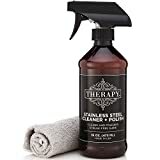 While I’m not a fan of using aerosols, because I’m a bit paranoid of breathing them in, there are some fantastic products for cleaning at home. In this review section we will cover both aerosols and liquid sprays. Our top pick has to go to the Sprayway stainless cleaner. And while this is an aerosol product, it has a reputation of working on everything and leaves a lasting coat that helps repel the dirt and grime until the next cleaning. If you have really tough stains or large spots of dirt to tackle, you should go at them with soap and water first before using this product. Ensure the area to clean is dry before using Sprayway because the oils in this product won’t mix with the wet surface and will ultimately create an ugly sight with streaks. Once things are looking new, weekly cleaning should help reduce the time you spend cleaning. Sprayway offers a variety of products to clean everything from glass to rubber, each with positive reviews and feedback and their stainless steel cleaner lives up to those expectations. Another cleaning leader is Magic by Homax! They offer wipes and an aerosol, but the aerosol seems to be a little more effective. You might have seen this product before, but they’ve recently updated their can with a new design. The top tapers off slightly, making it easier to hold compared to a standard can. It’s simple: Spray it on and wipe it off. As for cleaning ability, there’s nothing notable to complain about. If we had a suggestion for them it would be to add a microfiber cloth with each can to make it more of a complete package. While you can use paper towels or soft cloths to wipe with, microfiber just helps give stainless that extra bit of polish. 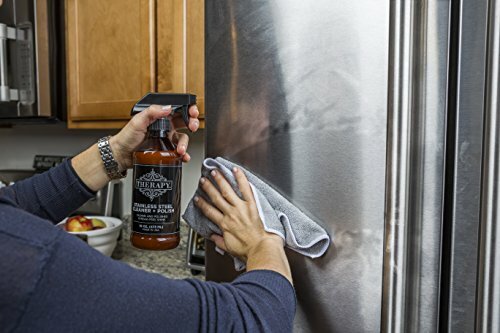 The Magic cleaner isn’t designed for cleaning inside stoves or stove-tops, but the outside of the fridge and dishwasher might appreciate a good magic cleaning. You’ve heard of Easy Off oven cleaner, but they also have professional series of stainless cleaner and polish for grills and appliances. It’s just as simple as their other products, shake, spray and then wipe. You might need a little extra wiping to get your stainless to shine. Once it does, it looks great. When using this product, it comes out like foam from a spray nozzle. There is a little extra dripping from it, but nothing that a quick dab with a cloth can’t handle. This isn’t our favorite cleaner for the kitchen because it is not safe for cookware and other food contact surfaces. It’s best for the outside of stoves, refrigerators and dishwashers. CLR is a “as seen on TV” brand, most famous for their jugs of cleaning solution that can tackle just about anything related to calcium, lime and rust. They have introduced their CLR stainless cleaner to tackle all stainless surfaces. This aerosol is interesting because when it comes out of the can it has a bit of a cream like texture, but wipes and dries quickly without a residue. Honestly, when I saw the name, their reputation had me hooked before I even looked at the product. I’ve used their general cleaner that comes in a jug in the bathtub and it worked brilliantly. Things that might turn you off include not being able to use it on it cookware, utensils, other metals and it won’t remove rust. A bit disappointing. If this is something available locally and you need something in a pinch, then go for it to clean your sink and fridge. If you have the time to source other products, we would recommend a liquid spray like Therapy Premium. 3M is another major household and industrial brand. They’ve entered the market with a more expensive stainless aerosol cleaner. While many cleaners have either a neutral or chemical smell, this one has a lime fragrance. If you aren’t a fan of lime or have allergies to citrus, you might want to avoid this one. Again, this is another cleaner than can’t be used with flatware or cookware. It’s a real shame because the price point is much higher than almost every cleaner we’ve reviewed on this page. All is not bad with this product. It’s easy to use, doesn’t leave a waxy buildup, and does what it’s supposed to do. If you don’t mind paying a little extra, it might be worth testing to see how it works for you. Cerama Bryte’s cleaner is one of few that openly advertises the type of oil that is in their product. This is largely due to the fact that mineral oil is the best type of oil to apply to steel to help prevent it rusting while maintaining a nice shine. The state of California recognizes this product to contain a chemical that may cause cancer, birth defects or other harm. While I appreciate the warnings, I think there is at least 1 chemical in anything we use that can cause issues. This product isn’t designed to be used on any type of cooking surface so forget about cleaning your pots and pans with it. This might be a great budget pick for those who want the shine on big appliances around the kitchen without paying commercial grade prices. If you’re finding that household cleaners just aren’t doing the job, you might want to try a commercial cleaner or professional version of your favorite brand. I don’t recommend that everyone purchase a commercial cleaner. They are often much stronger and more expensive. The average user won’t require it. But if you keen on picking one up, Zep stainless cleaner is stronger than a regular stainless cleaner and you may be able to get by using less of the product, in turn making it last much longer. This cleaner has a slight smell which may be off putting to some users which I think in part is because it is petroleum based. I recommend spraying this on to a cloth and not directly on to the surface that you want to clean. Again, Zep commercial grade cleaner is strong in many aspects so be careful. This cleaner hasn’t quite made the brand impact as the others, but it’s worth taking a look at if you prefer to have a spray vs aerosol. The general consensus is that this cleaner works, but doesn’t completely eliminate water marks as an example. They will definitely fade and it could just be that it takes a few good rounds of cleaning to completely remove them. The keys to using this product are keeping the cloth clean and wiping a few extra times to improve polish and reduce any potential streaking. You don’t need to do hard scrubbing with this product. Is it worth it? 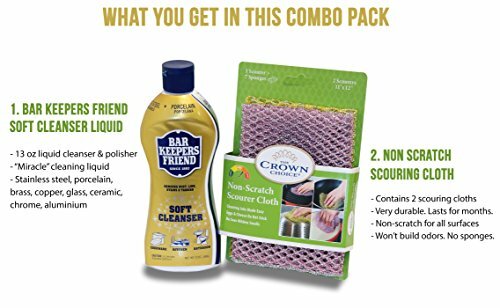 It’s a pretty good deal because it includes the microfiber cloth and the cleaner does clean and polish. Are there better products? Perhaps, but I’d recommend this to someone is looking to try something different than what they’re currently using. If you aren’t keen on purchasing products, or you’ve run out and need something ASAP, then the following ideas can help you get by. You can use glass cleaner for quick touch-ups and to remove fingerprints. Be sure the product you choose does not include chloride, as this can damage the surface of stainless steel. There are also some great homemade stainless steel cleaner options that can be made easily. Plain, white vinegar comes in very handy for cleaning stainless surfaces. Cleaning stainless steel appliances with vinegar is simple because you can make your own natural, thrifty glass cleaner by just mixing vinegar and water 50/50 in a spray bottle. Spray on and wipe off with a soft cloth or paper towels, just as you would a commercially prepared glass cleaner. For polishing, try using a soft cloth soaked with olive oil or plain white vinegar to wipe your stainless appliances clean. Pure white vinegar can also be used to remove lime scale. Club soda is also good for cleaning stainless. It works especially well on kitchen sinks. Soak a soft cloth or brush with club soda, scrub the sink and then wipe it dry to bring out the shine and avoid water spotting. Stuck-on adhesives can be removed using acetone or other alcohol based solvents. Baking soda can be used as a soft scrub to remove coffee stains. On non-food-prep surfaces, you can use cleaners containing silicone oil to wipe out smudges and fingerprints and really bring out a sparkle. Be careful not to use this type of cleaner on food preparation surfaces or on pots and pans. Silicone sprays are not safe for human consumption in any form. Even a good rinse will not remove all of the chemicals in these products. Products especially formulated for stainless are safe for your stainless appliances and surfaces, but be sure to follow directions precisely. A good polishing paste that is especially formulated for use on stainless can convey a lot of benefits. The best ones will impart a microscopic layer of wax on the surface of your appliance. This helps protect the metal and makes cleaning easier. Just say NO to steel brushes, steel wool, abrasive cleaners and harsh chemicals (e.g. bleach). Don't use dirty water or a dirty cloth or sponge on stainless. Start out with a fresh, clean solution and cleaning cloth or sponge. Change your solution frequently if it becomes dirty, and rinse out your cleaning tool. Give your appliance a second wipe-down with clean water to rinse away soap. Remember to dry and polish as the final step. Only use metal cleaning products that are safe and/or intended for stainless steel. Don't use silver polish or dips or products that are formulated for any other type of metal. These will damage the surfaces of your appliances. If you need to pre-wash your metal with soap and water, allow it to dry before using a cleaner. Many cleaners contain oils and will leave a huge mess when it comes in contact with moisture. Final Thoughts - Enjoy Timeless Elegance! Classic, practical, great looking stainless steel adds timeless elegance to any kitchen setting. Unlike enameled surfaces that can crack and rust, stainless can stay beautiful for decades and even improve in appearance with the passage of time, as long as you take good care of it. Remember that frequent, light cleaning is preferable to occasional heavy scrubbing. Stark white, basic black and a range of colors come and go, but if you have stainless steel appliances and kitchen elements (e.g. sink) your kitchen will always be in style. I know that this was a long read about something seemingly simple, but I hope that you will be able to walk away understanding how to keep stainless steel appliances clean, what your kitchen needs and be able to pick the best products for it. If there was a product that you were hoping to see, but wasn’t mentioned, let me know and I’ll do my best to get my hands on it and add it to this guide. Out of all the products covered, which would you buy? Foodies and home cooks across the country are always on the lookout for the best products and tips on how to use them. Please share your thoughts and experiences in the comment section below.